Everyone loves a big kitchen but the truth is that sometimes they’re not very efficient. Islands big enough to land small aircraft on require lots of steps to get around to access storage on the other side or wipe up after eating. Bountiful cupboard space makes the acquisition of esoteric cookware and appliances not only possible but probable since there’s no need to pass on say individual heart-shaped Le Creuset pans you’ll use once a year—you’ve got room! 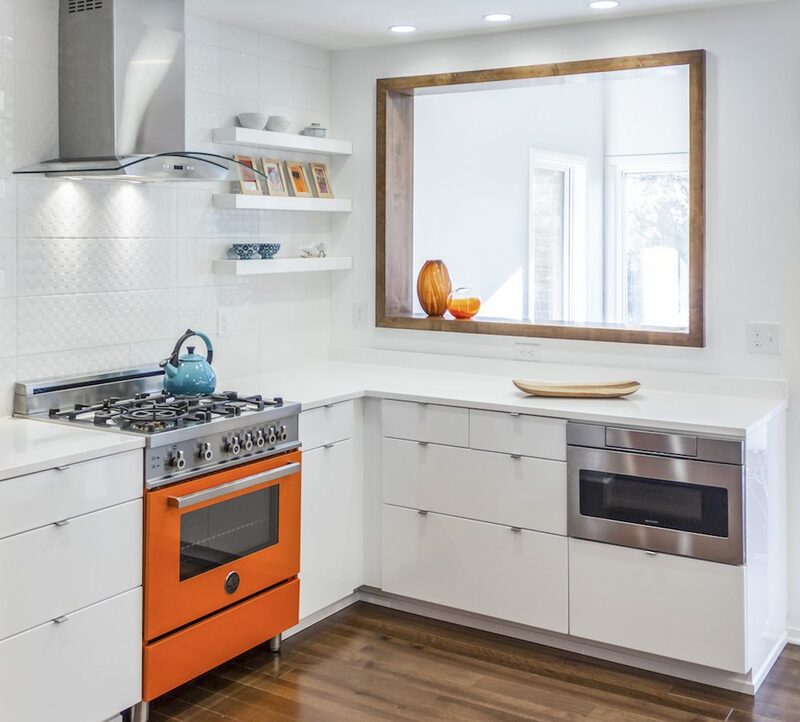 A small kitchen, on the other hand, requires much more discipline—each pot, gadget and Costco flat must be assessed for its practical value and whether it’s worthy of a spot on the shelf. This is also true of small kitchen design. Every square foot counts, so the design process needs to be thorough, creative and precise to make the most of this hard-working space. Designer and Minneapolis native Jennifer Jorgensen agrees. “Lots of houses, particularly old ones, have small kitchens, which are amazing and intimate but force you to make choices. In addition to making smaller kitchens more functional, it’s important to create light and airy spaces that allow the unique character of the house and the personality of the owners to shine through,” she states. Don’t limit yourself to where things are now. Moving a window, doorway or borrowing space from a room on the other side of the wall in order to gain an extra 25 square feet of space can make a huge difference in the flow and feel of a small kitchen. 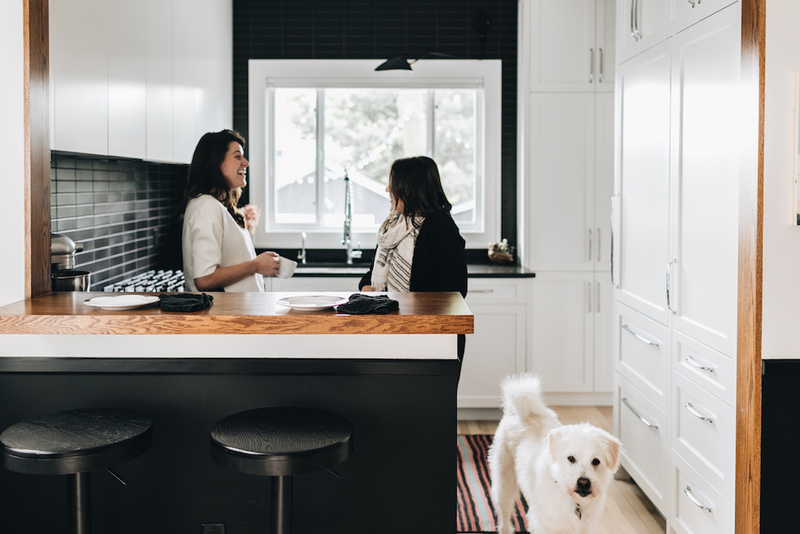 Homeowners are often afraid of making structural changes, but they shouldn’t be because it’s usually those changes that make the biggest impact. Opening up a wall to create a bar to sit at, or a pass-through like the one below can connect the kitchen to the rest of the house, allow natural light to shine though and keep the cook engaged with guests without having them in the way. Moving a doorway or window can free up wall space and improve functionality. Even something as simple as opening up the sheetrock or plaster between wall studs to create a recessed shelf or cupboard can add interest and useful storage. The fewer colors and finishes, the more open the space will seem. Varying textures will keep it from feeling bland. White is a natural choice, but unfinished wood and even darker colors can feel spacious when used in an otherwise restrained palette. Everything in a small kitchen should fit like a glove, with no space wasted which often means custom cabinetry or a mix of stock and custom. Stock cabinet widths probably won’t fit the space perfectly, and require filler pieces which results in unusable space, and their standard 24″ depth might take up too much floor space in narrower kitchens. Some cabinet makers do offer stock in shallower depths (12”, 15” or 17”), but it’s probably worth exploring custom cabinets built to your specifications or a mix of stock and custom. Inset or full overlay doors offer a more streamlined look than partial overlays. Consider leaving off upper cabinets altogether in favor of floating shelves, windows or a feature wall or, if you can’t do without uppers, use glass shelves and fronts to make them visually lighter. Choosing solid color counters or those with subtle patterns will make the space seem bigger. Integrated kitchen sinks can be another way to keep the space unbroken. Extending tiled backsplashes to the ceiling draws the eye up and makes the room feel taller. Appliances take up a lot of space, and smaller versions of even professional grade models are available. Consider your habits, how often you grocery shop, cook for a crowd, etc. and choose accordingly. Maybe you don’t need an 18 cubic foot refrigerator or 36″ cook top. And splurging for built-in or at least counter depth (24″) appliances is another way to present a clean-looking profile. 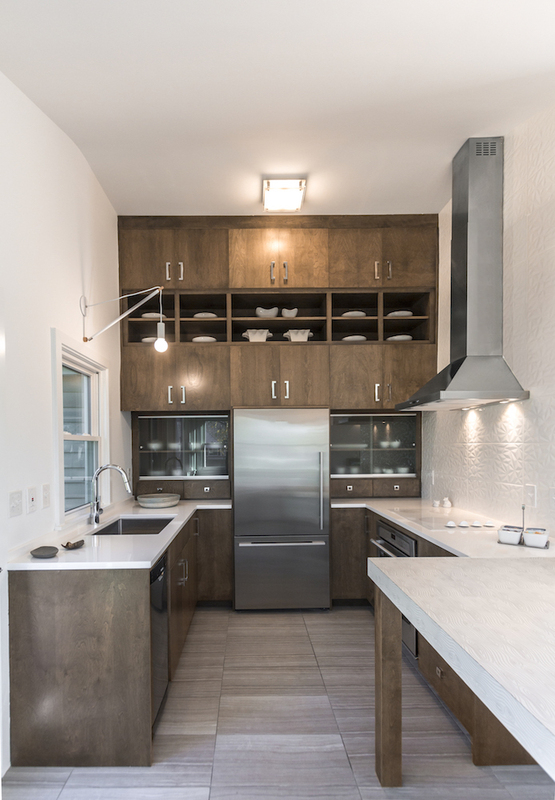 Panel ready appliances, like the built-in refrigerator below (on the right), blend in with cabinetry and make the space look polished and balanced. Natural light is everything in a room you spend so much time in so leave the windows unadorned if possible. It will also cut down on visual clutter.